The Universal Living Wage Campaign - http://www.UniversalLivingWage.org - in conjunction with the National Coalition for the Homeless and more than 1,600 national, state, and local organizations, businesses, religious groups and unions across America, is hosting its annual Bridge the Economic Gap Day all across America. 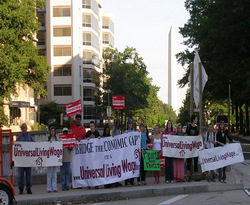 Bridge the Economic Gap with a www.UniversalLivingWage.org. National/Local Day of Action- "Bridge the Economic Gap Day" to not just increase the federal minimum wage, but to fix it once and for all. To tell President Obama that the Federal Government is the single greatest manufacturer of homelessness today as a result of it's Federal Minimum Wage that creates impoverished homeless people out of decent minimum wage workers. Where: Bridges in every state in America see http://www.UniversalLivingWage.org for City/State Bridge Locations and contact information. We have found that American business has grown to rely on government subsidies to pick up that portion of the basic wage that they have failed to provide. Workers have been forced, in ever increasing numbers, to depend on food stamps, general assistance, and TANF. Congress intended these to be emergency, stop gap measures. Instead, many businesses use these government supports to meet basic payroll. A national shift is occurring away from the business responsibility of paying a "fair wage for a fair day's work" to creating an ever increasing burden on the tax payer. The Universal Living Wage is an initiative to fix the Federal Minimum Wage with a single national formula based on existing government guidelines. It indexes the wage to the local cost of housing and ensures that anyone working 40 hours a week through a full time or multiple part time jobs can afford basic rental housing wherever that work is done throughout the entire U.S. See http://www.UniversalLivingWage.org. After eight years, of local and national grassroots organizing, we have asked our supporting organizations to get on the bridges of America and fly the banner "Bridge the Economic Gap with a http://www.UniversalLivingWage.org. " We are now in all 50 states with separate actions across America. National Chairman, Richard R. Troxell, has stated that "We, the everyday citizens of America, declare that as a country we must 'Bridge the Economic Gap' that separates the working poor from everyone else and that we can do this with a Universal Living Wage. Conservatively, enactment will end homelessness for over one million minimum wage workers."